Christian Horner feels Red Bull Racing have the best driver partnership on the grid this season. Christian Horner wouldn’t have any other drivers at the wheel of the new RB13 than Daniel Ricciardo and Max Verstappen. After overhauling and cruising past Ferrari in the latter part of last season, Red Bull ended 2016 second behind the all-conquering Mercedes duo of Lewis Hamilton and world champion Nico Rosberg. Fundamental regulation changes this season could see the pack shaken up, with a host of cars being unveiled this week ahead of Red Bull’s newest contender - the RB13 - breaking cover this Sunday. 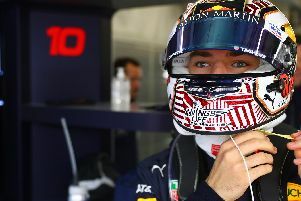 Max Verstappen will begin his first full season at Tilbrook while Daniel Ricciardo will be entering his fourth as they look to take the battle to Mercedes this season, and according to their boss, there’s no other pair he’d rather have racing his cars. “We have the most exciting pairing on the grid,” he said. “It’s so exciting to see the development and evolution of Max Verstappen as he’s growing in experience and confidence at the heady age of 19! “Daniel Ricciardo was the driver of the year for me last year, he put in some phenominal performances last year and his confidence is high. He’s at the top of his game. “The dynamic between the two is great, they’ll push each other very hard, which is great from a team perspective. I couldn’t wish for two better drivers in our cars. “They’re both ferocious drivers. There aren’t two better over takers out there than our two guys. They’re dedicated, but they love what they do, and they’re having fun. The change in the designs of the cars for this season has left many teams to leave the unveiling of their cars until the last minute ahead of the start of pre-season testing next Monday, but Horner believes the RB13 is on schedule. He is wary though that other teams may have uncovered loopholes in the new regulations which others may have missed. He said: “Back in 2009, there was the double diffuser - will there be something like that which we’ve missed that others have found? Hopefully not, and hopefully we’ll be competitive. “We went into the winter on a real high. Momentum really built towards the end of the season - we developed the car well, we raced well, strategically we were strong.